Tom and Katie were photographed heading to dinner at an Italian Restaurant with 4-year-old daughter Suri in Prague last night. 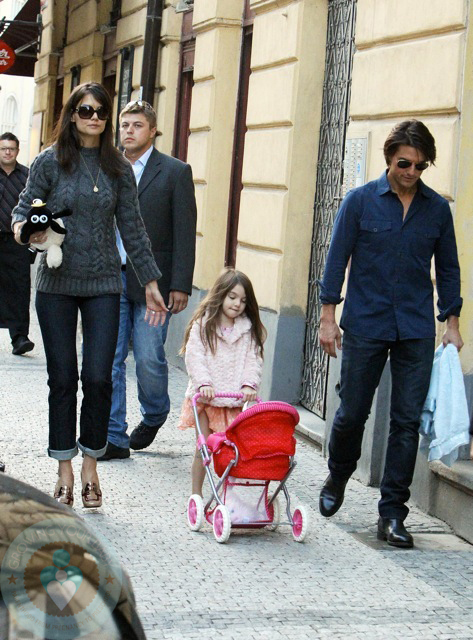 A fashionable Suri proudly lead her parents through the capital city as she pushed her stuffies in her Corolle doll stroller. Tom is reportedly in Prague to scout out the best locations for the fourth Mission Impossible film for which he is not only the lead actor but also apart of the writer and production team on the film. Rebecca & Jerry Tote Their California Cuties!